Greek giants, Olympiakos are set to honour returning former Coach Ernesto Valverde when he leads his current side, Barcelona in Greece on Tuesday night. The 53-year-old enjoyed two stints in charge of the Piraeus-based club, winning the league title in each of his three seasons alongside two Greek Cup successes. Having won all three of their group games, the Spanish giants will be hoping to maintain their perfect start to this season’s Champions League when they play on tonight. “He’s back as the boss of Barcelona”, writes Greek newspaper Protathlitis, as cited by Diario AS. The Barca boss, who led his squad to his former side on Monday, also said that the game against Olympiacos would be an emotional one for him. 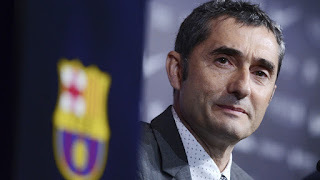 “To return to Athens is very exciting for me,” Valverde told his pre-match press conference. “This club and this stadium means a lot to me, just as Athletic do, and to return is a special moment. “This is an important match for us as we can qualify for the next round but it is also important for Olympiakos’s position within the tournament too. Meanwhile, the Greek club’s Ultra group Gate 7 is also said to be planning their own pre-game tribute to Valverde, who is held in high regard by the club. Olympiakos have had a wretched start to their campaign, losing all three of their Champions League group games alongside sitting fifth in their domestic league with three losses from their nine outings.